This article was written by Geoff Hall and first appeared in Oakwood and District Historical Society’s ‘Oak Leaves’ in Spring 2001. We are very grateful to Margaret Hall for giving us permission to include her husband’s article on this website. Extract from Slaters Directory of Northern Counties 1848. At the time the above note was written, a horse drawn “omnibus” had been running for five years from the Black Bull in Leeds to the toll bar at Roundhay. This service was extended to Scarcroft a couple of years after inauguration and two competing owners were providing transport. A very sparse timetable was in use, with a morning service from Scarcroft and return in evening and lunchtime, Leeds to Roundhay and return in the afternoon. From 1851 things had settled down and service was provided by a man named Machin who had his stable at Scarcroft. He met the needs of the local people for the next 20 years. Turnpikes within the Leeds boundaries were abolished in 1866. The population of Roundhay remained fairly static over this period at between 400 and 500, the wealthy merchants of course had their own horse drawn conveyances and would be unlikely to patronise the omnibus service. In the latter half of the 19th century the road to Roundhay from about Spencer Place ran through countryside, Harehills as we know it now had not been built and Harehills Road did not exist until around 1880. Roundhay Park was officially opened in 1872 and over 100,000 people were believed to have attended the ceremony, most of these would hav hd to walk from Leeds. Unregulated waggonettes provided a spasmodic and totally inadequate service at weekends but no reliable service was available for many years with the consequence that the hoped for sale of land for building did not materialise. In the 1870s some far fetched proposals were made for transport to the park. One was for an elevated railway of similar design to the New York system. This was never developed. A gentleman named Wheaters sought support from the North Eastern Railway Company for a conventionl railway which was carefully examined but rejected on financial grounds. This scheme envisaged a station and junction with the NER line near the White Cloth Hall and to be routed up the Meanwood valley to another junction with a line via Headingley to rejoin with the NER at Burley. These two lines were then to continue via Chapeltown and across to a station near the Mansion at Roundhay and thence via Gipton Wood and Coldcotes to rejoin the NER between Selby Road and Osmondthorpe. Mr. Wheater’s argument for this scheme was based on the fact that most of the population of Leeds lived on the south and west of the city and this railway would avoid them having to pass through the centre and that access to the NER lines was already available from stations on the south side of the river. Although nothing came of these proposed passenger railways, on short line was constructed and used fr hauling coal. This was known as the Low Moor Colliery Railway. Its purpose was to convey coal from Gipton Pit located approximately where Coldcotes School now stands to an elevated coal shute just under a mile away and close to Harehills Lane at the top of the hill to the south of the Fforde Green. Gipton Pit was surrounded by the farmland which covered the whole area to the East of Harehills Lane and South of Gipton Wood. This railway was shown on a map dated 1891. In 1878 Prince’s Avenue was opened from Horse Shoe Corner (Oakwood) to the Canal Gardens. The name Oakwood came into usage about this time from a large house of that name nearby. Two years later Street Lane was opened to Moortown. By 1880 the Roundhay omnibuses were using Princes Avenue as far as canal Gardens. A year later they were stopping at the lodge built by the Corporation near the present site of Oakwood Clock. In 1889 Leeds Corporation arranged to build a track from Sheepscar to Horseshoe Cottages, Roundhay to be leased to the Tramway Company already working other lines in Leeds. Because the Tramway Company had insufficient rolling stock they were unable to provide an adequate service to Roundhay for a couple of years. What service was provided used the new steam hauled tramcars which had been in use elsewhere in Leeds for sometime. At Sheepscar the tracks joined those existing from Leeds to Chapeltown. 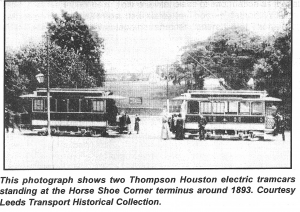 At this time the Thompson-Houston Company of America came into the picture offering to install and operate on behalf of the Corporation an electric powered system using overhead wires and the rails as the means of energy transmission. Nowhere else in Europe had such a system been used and the decision by Leeds Corporation to take up the offer was a very bold one. As part of this scheme a new set of tram tracks was laid along the recently built Harehills Road to the end of Beckett Street where a depot and power staion was built, steam engine driven dynamos were installed and the whole scheme was completed and opened in late 1891. It is conjectured that coal for the power station may have come from Gipton Pit via the railway and coal shuts. A length of tramway was built from Harehills road to the coal shuts which would have provided an economical way of transporting coal. 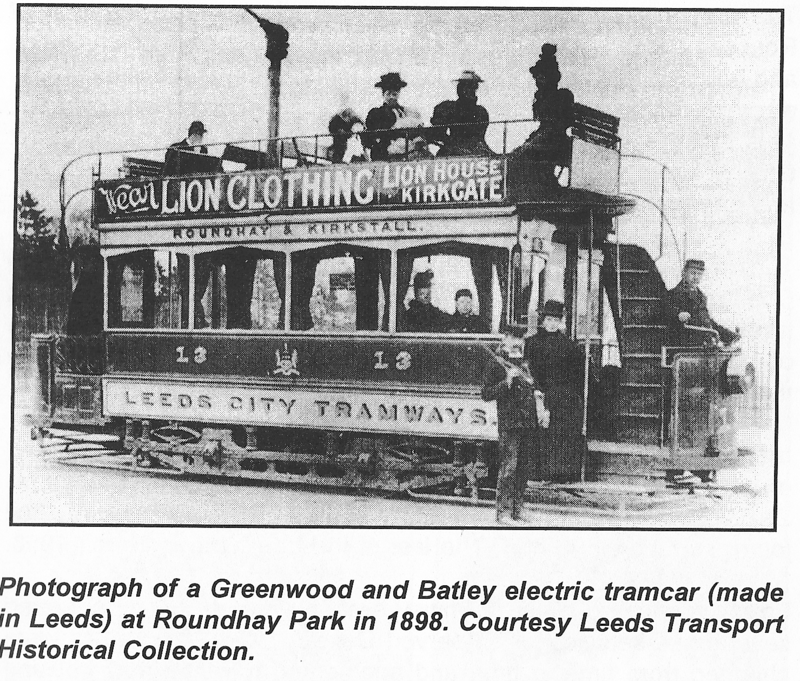 During the conversion to electric traction, Leeds Tramways Company continued to operate a steam hauled service to Roundhay on the Corporation owned tracks. Once a few minor teething troubles were overcome a very efficient service was operated by the electric tramcars at fifteen minute intervals between Sheepscar and Roundhay from 6.00 al until 11.30pm. Soon afterwards the frequency was increased to give a nine minute interval. In 1896, Parliament authorised the Leeds tramways Bill and the Council promptly gave notice to Thompson Houston Company. The electric trams ceased running from the end of July and steam trams took over the service. The tramline was extended to Canal Gardens prior to July 1897 when a new electric service came into use under the City Council with services running between Canal Gardens and Kirkstall Abbey. Electricity generation was based at a new power station at Crown Point. This was the start of a very extensive system which was developed in Leeds and lasted until the end of the 1950s. By 1905 trams were also running to Roundhay via Sheepscar, Chapeltown and Morrtown using Street Lane. 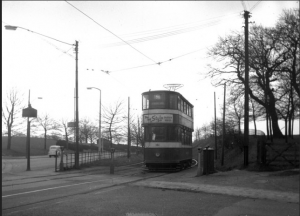 The tramway system was the key factor in the development of Roundhay as a suburb and the popularity of the park at weekends and holidays for the people of Leeds. In 1920 the first children’s day was held in the park which required the movement of vast crowds. This event was to continue for the next 43 years. The biggest challenge to the tramway was in 1926 when the first Tattoo was held and an estimated 120,000 people attended the park. 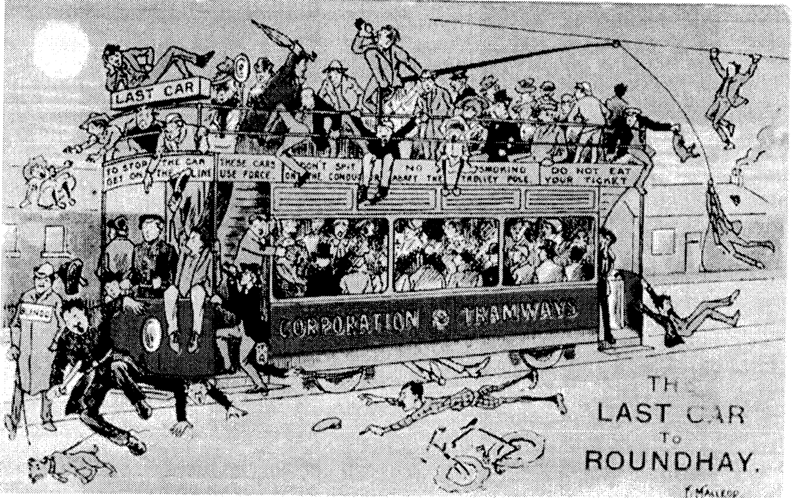 The monopoly of the trams was first challenged in 1924 when the City Council reluctantly agreed to allow bus companies to come into Leeds from places outside the city boundaries. A leeds to Wethrby service operated through Oakwood shortly after this but fares were higher on the bus, and the trams were little affected. In 1931 the tram service between Briggate and Canal Gardens started on weekdays at 5.30 and ra with a frequency of five minutes until 23.30, the journey time was 22 minutes and the fare for the full journey twopence (0,8p)!. The last of the trams ran in March 1958. Following closure of the tramway system, Leeds Council operated several bus services which served Oakwood well. The routes were changed from time to time and augmented to serve new housing development. Following privatisation of bus services, a variety of companies now vie with each other for customers but still follow the basic routes, some of which differ very little from those adopted when the Corporation developed the tramway system. In the latter half of the 20th century the private car has allowed the public to travel further afield in leisure time, and the use of the park has dwindled. The opening of Tropical World however has brought a weekend problem for car parking which may eventually lead to the provision of more parking spaces at a cost to the open spaces of Soldiers Fields.